Durango, CO – Former U.S. Ski Team member Jack Turner, announced the official launch of the Ski Nation mobile application available now on iOS (iPhone). The app’s Android version launches next Friday, November 21. The Ski Nation mobile app features updated snow conditions provided by SnoCountry, trail reports, trail maps, photos, and resort information for more than 950 ski areas in North America, a list that’s expected to grow as more “off-the-radar” areas are added. All ski venues are pre-loaded including downhill alpine areas, cross-country, and even ski jumps. The list includes major resorts, regional areas, local ski hills, and community facilities. Skiers and snowboarders can also collect free digital pins to track a lifetime of all the places they’ve been, how many seasons on snow, gear preferences, skill, and more. The first version of Ski Nation is a starting platform to build an open, independent, and comprehensive network for skiers and industry members to connect. 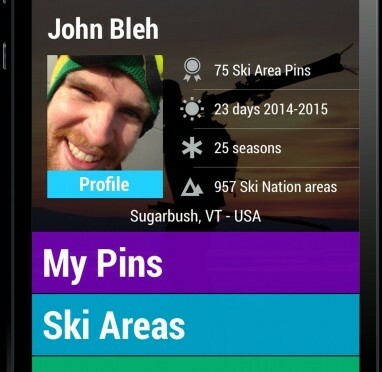 For skiers, the app is free and their personal information is secure. In addition to ski area vitals, the mobile app rotates trivia tidbits to engage users in the rich history and culture of riding snow. Future plans include the opportunity for resorts, gear companies, and sponsors to make information and offers available directly to skiers on an opt-in basis. Download the free Ski Nation mobile app at www.SkiNation.com, in the Apple App Store, or (beginning Nov. 21) at Google Play.